New Zealand is a country in the southwestern Pacific Ocean made up of two main islands, North Island and South Island. New Zealand’s population is approximately 4.5 million people. It has many refugees who came from different countries such as Syria, Afghanistan and Colombia. In the last few years, many terrorist incidents took place around the world and I believe that this kind of people who tend to become terrorists have bad images of certain religion or community as well as they may be raised and treated differently in their families or society. On 15 March recently, a horrible incident happened in Christchurch, New Zealand. 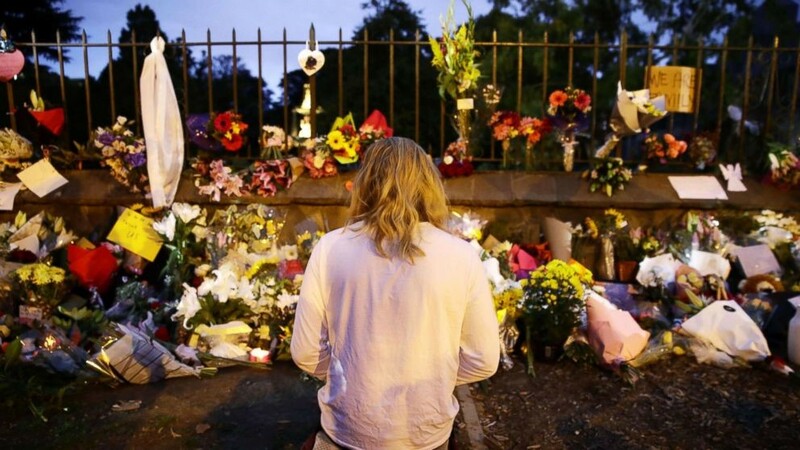 A terrorist who was identified as an Australian citizen named Brenton Tarran, 28, had attacked two mosques during Friday prayer. He entered the mosques while the people are praying and started shooting them with semi-automatics refile weapons. Meanwhile, the shooting attack was live-streaming on Facebook. Therefore, it was spread out worldwide. That led to kill at least 50 people and 50 injured in Al-Noor mosque, while 7 people were killed in Linwood mosque. The shooter’s thoughts were filled with Islamophobia and anti-immigrant feelings. It can be noticed from his weapon. 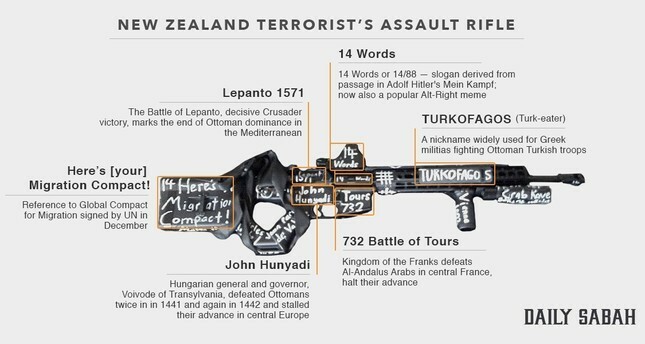 He painted on his weapon the mass murder with their names such as Euro Christianity’s victories against Muslims, Turks and Ottomans. However, the terrorist attack has been covered by most of the media in the world. Everyone knew about this attack from articles, broadcasts and social media reports. Nowadays, media is playing a very important role in communication regarding issues around the world. After examining some of IIUM students’ views, it was found that some agree that there was wide media coverage of the shootings while others disagree. For that, there are many strengths and weaknesses of the media coverage on the incident. Among the media strengths is that the Facebook company removed immediately the video after the call by the police to avoid violence and racism. Secondly, some media channels did interviews with people who survived and saw what happened. For example, Sky News Arabia did an interview with the Linwood mosque’s guard who tried to protect the people and to catch the shooter. Lastly, they covered New Zealand Prime Minister’s speech when she defended the Muslims against racism and terrorism. Furthermore, the news covering the attack had proved to the world that terrorism has no religion and Muslims and non-Muslims must unite and fight against it. On the other hand, there are some weaknesses of media coverage on the incident. First of all, after they caught the shooter, the media or the authorities decided to blur his face. That spurred many questions being asked like whether it is an attempt to hide the facts? Or did the government really catch him? In addition, a teen, “Egg Boy”, smashed an egg on the Australian senator Fraser Anning’s head, The senator was blaming the Muslim immigration for the racist incident. For that, twitter decided to close his account. Some Malaysians expressed their unhappiness towards the local media for showing the shooting video, while the Malaysian Communications and Multimedia Commission (MCMC) warned of legal action against social media users who share the video recording of the attack. Users should be aware of the sensitive and violent scenes that may affect children’s behaviour. On our role as Muslims, we have to express our sympathy and love among the people who lost their relatives and siblings. Also, we need to show to the world that Islam is not a terrorist religion by understanding the extremists’ views and trying to know from where they took this idea to convince others that Islam is peaceful religion. Also, show the world that Islam is the religion of peace and love by thanking the people from all over the world who gave their support to the Muslims. For example, thank the police who protected the Muslims while they are performing Jumaat prayers in many countries such as the United States and Japan and people who offered their condolences to the victims. As Muslims we have to behave nicely towards human beings as our prophet Muhammad (peace be upon him) taught us to greet and smile at others. As IIUM students and part of the global community, we play a vital role so we have to speak out our mind and express our opinion and thought. For that, we should always talk and point out the prophet’s stories through platforms like IIUM.fm and IIUMtv to show how forgiving and sympathetic he is towards non-Muslims. Also, sending out fliers, giving donation and delivering speeches that convey the truth in defending our identity as Muslims, would help. In addition, we can make a documentary about Islam or terrorism to show the differences between them. Besides the documentary, we can write short letters to express our sympathy and condolences to New Zealand victims and send it to IIUM.fm or IIUMtv, so they can collect it and make a manifesto. Lastly, help the Muslims who are still being discriminated by others, at all time, not only because of one incident that happened.